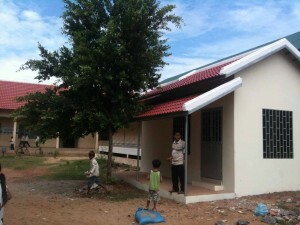 Bike 4 Cambodia are very proud to confirm the opening of a new Dental clinic, built in the grounds of Tonlebet School. The majority of the equipment has been donated by Swedish dentist Karin Jonsson and Cambodian based charity One-2-One, and Bike 4 Cambodia are very grateful for their support. Festival Republic paid for the construction. The Dental Clinic will operate with one dentist and all treatments will be free for students of Tonlebet, Krola, Thmor Khol, Prejick, Ror Angler and Pung Ror schools though we hope to extend this to more schools in future.